To make the commute on the tube a bit more tolerable I’ve started listening to podcasts to and from work. I mainly listen to Swedish food podcasts, and one favourite is Klas Lindberg & Klas Lindberg. It’s two guys with the same name, one well-renowned chef and one journalist with an interest in food and they are just so lovely and inspiring to listen too. 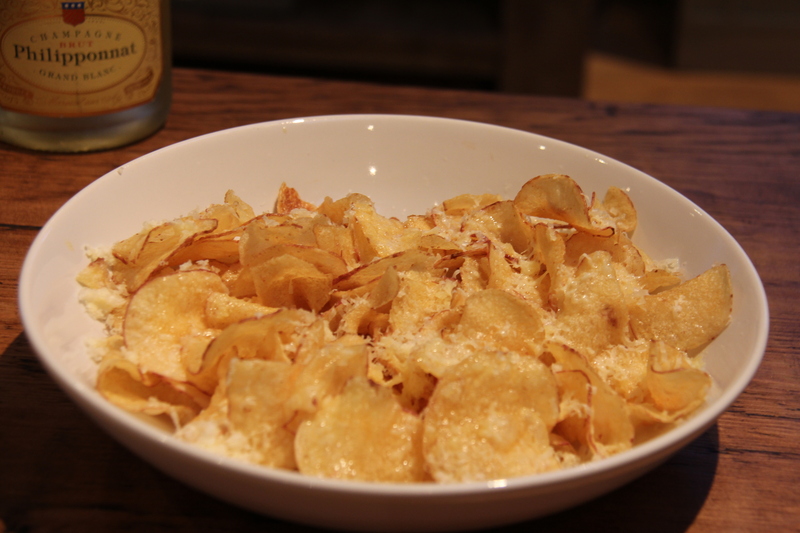 One of the recipes I was dying to try after I listened to it, was these crisps with browned butter and Comté. It just seemed so simple and delicious and it certainly was. Ask my parents, who I made it for when they were visiting. Together with a bottle of champagne (Philipponnat Grand Blanc NV) it was such a lovely start to our meal. Can’t wait to make this for more dinner parties (or just for me when watching a good film)! Place the crisps in an oven-proof tray and put in a 100C oven for a few minutes (they heat up quickly). Meanwhile brown the butter and put aside. Finely grate the Comté. Remove the crisps from the oven and put on a serving tray or plate. Drizzle with 3-4 tbsp browned butter and add the grated cheese. Squeeze over some lemon juice and serve. Pingback: Second week of holiday!